Q: What is a water well? A: A well is any hole either dug or bored into the earth to obtain water. Q: What are the advantages of having a well? A: The advantages of a private water supply are: a) eliminate town water bans; b) Eliminate costly municipal water bills; c) Constant 52 degree water. Q: What type of well do I need? A: The type of well you need will be based upon your needs and the topography of your land. A: The amount of water you need will be based upon your daily usage including a) size of family and house; b) Irrigation requirements; c) Any other water usage required. Q: How do I choose a location for my well? A: The location of your well will be decided by a) State and local codes, including septic, property lines, wetland and other various setbacks; b) Proximity of utilities; c) Accessibility for drilling equipment; d) Overall economics. Q: Do I need a permit to install my well? A: Depending on the town, the Board of Health is the governing body who's codes dictate whether a permit is required or not. Q: Is there a way to know how deep my well will go and how much water it will produce? A: All wells vary in depth and yield, but prior knowledge of your area might give us some indications on what to expect. Q: Does drilling a well make a mess of my property? A: During the construction of the well there is a mess, but once completed and re-landscaped the final results far outweigh the short term mess. Q: Will my well need service? A: The well itself will probably not need servicing, the pumping system depending on usage usually will last between 10 and 20 years. Q: Does my well come with a warranty? A: All wells installed by Odgen Wells come with a standard one year warranty; additional five year warranties are available on the pumping systems. 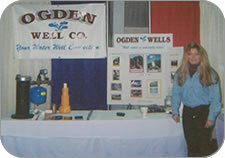 Please contact us for more answers to questions you may have about water wells.